Like macro photography and happen to be using a smartphone with a decent enough camera? iPhoneography is booming with the recent bump in pixels on the iPhone 4S and many great adapter lenses available like the olloclip to help spice your composition up a bit. Photojojo's Macro Cell Lens Band is looking to replace the olloclip with its versatility and easy on-off, rubber band good charms. It apparently works with slim cases as well, so triple the charm! The Macro Cell Lens is a sturdy rubber band with a macro lens built into it promising sharp focus, details and best off all its compatible with almost any smartphone. 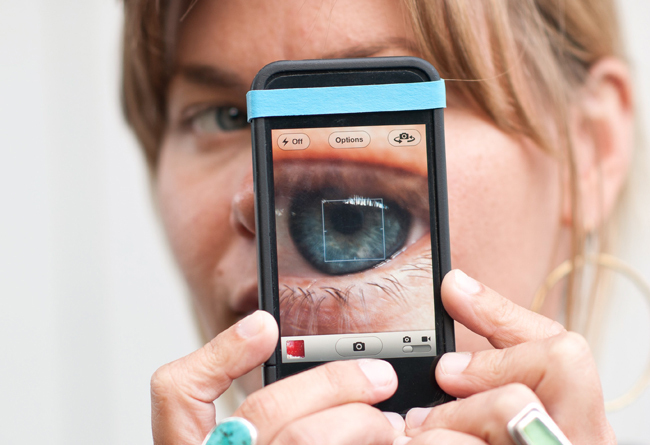 This searchable lens band is unsurprisingly iPhone 4S and iPhone 4 compatible by the looks of it. Hit the link above for some action shots. In any case, it'll cost you just $15 and comes stretched conveniently on a plastic card for wallet storage.